What may have sounded like an interesting premise on paper ended up as an absolute mess by the time it hit the screen. What’s the worst that could happen when a group of vacationing teens decide to embark on a bit of “extreme vacationing” in the abandoned town of Prypiat, which sits in the shadow of the Chernobyl Nuclear Power Plant? If the first thing that came to your mind was “a horrific and lifelong battle with cancer, ultimately ending in death”, or perhaps even “two harrowing days filled with mutated cannibals and feral dogs”, you’d definitely be awarded a gold star or some sort of medal of honor for doing your best but ultimately falling short of the mark. No, the worst possible thing to come out of such a scenario would be sitting in front of your television for 86 minutes, forced to watch the abomination known as 2012’s Chernobyl Diaries, a film which chronicles just such a heinous event. It all begins quite innocently. Chris (Jesse McCartney), a young man who could pass for Justin Beiber’s infinitely-less talented older brother is vacationing in Europe with his girlfriend Natalie (Olivia Taylor Dudley) and their mutual friend Amanda (Devin Kelley). Stopping in Kiev to visit Chris’ brother Paul (Jonathan Sadowski) before heading to Moscow where Chris intends to propose to Natalie, the group decides to take Paul up on his offer of a quick trip to a town ravaged by a nuclear disaster only a quarter of a century earlier. Hey, they’ve got a creepy Russian guy who served in the Soviet Special Forces. What could possibly go wrong? After being joined by an Australian hippie and his Norwegian girlfriend to add a bit of foreign flavor (and up the body count), the group sets off on undoubtedly the stupidest vacation idea of all time. What follows is nearly one full hour of tediously bad acting punctuated by loud bursts of music and a shaky camera intended to strike fear into the heart of the viewer. Occasionally, the protagonists run from shadowy figures resembling the creatures from The Descent crossed with that creepy guy from The Hills Have Eyes while avoiding some of the most commonly used scenarios in modern horror films. Blurry figures in the background of a picture you took yesterday? Check. Abandoned dolls with no clothes on, covered in soot? Check. Broken swing sets and overgrown weeds? Check. Shattered windows dripping with fresh blood implying that the place you thought long abandoned might actually be inhabited? Oh, you better believe it! Not only does the trailer for this movie give away every single would-be scary moment of this movie, it is actually vastly more frightening than the movie itself. Hell, even the back of the box is scarier than the movie inside! Now, it’s true that some films fall into the “so bad it’s good” category and that bad acting can often enhance the overall entertainment value of a poorly made horror film. One can even argue that horror films should simply offer escapism of a more visceral order. And as a fan of trashy cinema, I might even make that argument myself on occasion; but even the corniest B-movies must have a touch of imagination or a small spark of quality, whether it be in the creative ways a filmmaker stretches a low budget or simply an abundance of gore to offset a weak script and/or cast. And even bad acting can be overlooked if it’s followed up by a bone-chilling scream. Chernobyl Diaries offers none of these things. It’s not “so bad it’s good” - rather, it is “so bad I actually felt obligated to make a joke earlier in this review alluding to the fact that dying from the cancer one might be stricken with after visiting a radiation-soaked area would be preferable to watching it despite the fact that several members of my family have dealt with cancer in their lifetimes”. Yes folks, it is that bad. I didn’t make that joke because I thought it was funny; I made that joke in the service of all humankind, to ensure you, the reader, knew just how terrible this movie was. I found myself wishing that the Blu-ray had been packaged with two tiny, spherical radiation suits for my eyeballs, to shield them from the atrocity I witnessed in 1080p, high-definition picture quality which maintained the film’s original 16x9 aspect ratio. What may have sounded like an interesting premise on paper ended up as an absolute mess by the time it hit the screen, with absolutely no suspense, originality or even any real atmosphere, despite being filmed in Hungary and Serbia. The Blu-ray includes a deleted scene, an alternate (and superior)ending and a faux-commercial for Uri’s Extreme Tours. It also includes a “Chernobyl Conspiracy Viral Video”, which uses real footage from the nuclear power plant and the resulting disaster and alleges that the events depicted in the movie may have been inspired by real events. Clocking in at around two minutes, this brief piece of filmmaking is infinitely more frightening than the movie itself and had it been somehow worked into the narrative, may have actually salvaged this atrocity. I’m not even going to bother ending my review with some witty catchphrase or an attempt to humorously dissuade you from seeing this movie. Sure, I could call it a radioactive turd or say that there’s “sure no bull” in my review, but what would be the point? I’m too worn out from having to think about Chernobyl Diaries long enough to write this review and my humor banks are all used up. Besides, chances are you were so offended by my cancer joke earlier (as well you should have been) that you haven’t even made it this far. But if you did stick with me for the entire review just...god, please do not see this movie. I say that because I care. 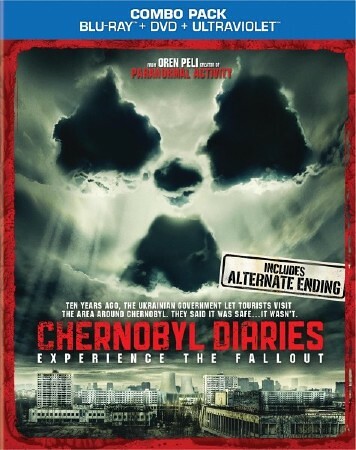 Chernobyl Diaries is now available on Blu-ray Combo pack, DVD and for download!